My husband persuaded me to sign up to the Shamanic Practitioner’s Conference that this year is taking place at the “Edge” retreat center just outside Algonquin park. The organizer had put out a “request” to try and journey to the Loon to find out information about what the subject of this conference is supposed to be!?? For me the Loon is inevitably Maang, the “ Ee’ren – or “Manitou” of all the Loons everywhere on Mother Earth. 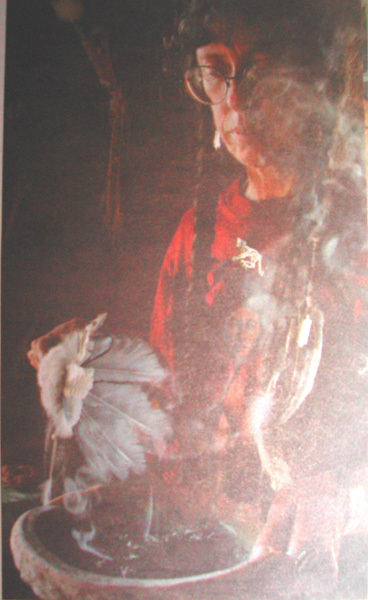 He also is the Clan Guardian of the Anishinaabe Loon Clans and as such I have had dealings with Him on several previous occasions. So I was not surprised to find myself immediately in the middle of the primordial waters just after the Great Flood with Nananboojou sitting astride on Gineebik, the Great Underwater Serpent and surrounded by the assembly of Clan Guardians. 2 of my personal Guardians accompanied me and also sat down on the log-like Snake. I was somehow suspended in the water. Maang spoke in a “grovely picture language” = lots of gravely rough pebbles in and among the images….which were greyish brown and …sad. There were scenes of people driving loud and smelly motor boats up and down a lakes or waterway and waves were splashing ashore and into a Loon’s nest drenching it…. There was a knotty ball of fishing line with rusty poky hooks littering the lake’s bottom and entangling garbage and debris. There were these gray lead weights in and among the rocks. No sooner had Maang stopped transmitting his message, when Ajechau, the Crane stepped forward and repeated every image Maang had shown me. There however was also the image of a group of nesting trees being cut down and…..?? The drum group had stopped playing the first rhythm and started talking, but A., with some shamanic experience, saw, what was going on and started a steady fast trance rhythm, that transported me back to the scene. But it was to get a lot worse, as next Wabi zashi, the Marten spoke up and showed me a horrrrrrible fur farm – somewhere outside – or near New Liskard, where 2 middle aged men worked. One of them was smoking. Martens, Mink and other fur bearing Brothers and Sisters were transferred into small cages and these cages were then put into an old freezer truck and a hose was attached to the exhaust and into the compartment and then the engine turned on. Then the men left… the horror and suffering that came next made me nauseous and still does again now….. When the men returned ?? the next day? ?, they skinned the Marten People and put the carcasses on ice –?? for a business that makes canned cat food…..!!!!!! The Pelts were to be shipped to Hong Kong. The Next Manitou that spoke up to me was Wawashesh-shee the Deer. He showed me a place outside ???Huntsville??? where a butcher works. This man cuts up the Deer and Moose People and prepares their meat for the hunters to take home. But the hunters do not want the legs and the heads and most also do not want the fur. So it is all “dumped” in a remote bush location. The leader of the Deer Clan wants the people to use the hides! He would gladly give away the hides free to people! I again said I was sorry and promised I would tell here, so these hides can hopefully be used. Nowadays the people hunt his kin for sport, not for food and often do not use the meat for anything other than their dogs. Also the pelts are not used and the head of hunted Bear People are not properly hung into a Tree facing east. If this continues, illnesses and diseases will come….. The drum group had again stopped playing and so I did, what I was shown to do in situations like this…..
…there is a certain healing rhythm and chant .. …. I found myself back at our drumming location……. I was a bit shaken and exhausted and F. offered me a cup of hot tea…….. Early yesterday morning I journeyed back to the Place of the Waters and all the Animals were there, waiting. Somehow I had a can of Tuna and opened it and several large live fish came out. Then occurred it to me, that everyone of the Ee’rens = Manitous eat Fish…. but Wawashesh-shee said, that I was very wrong there. He ate no fish! Sturgeon spoke up for the Fish Clan and showed me a devastated bottom of a huuuuge river – ? St Laurence near ?? Montreal?? with a thick layer of oily sludge on the bottom that was littered with garbage and large derbies and oil drums and also parts of machines from large boats. The last Clan I thought would speak up was the Bird Clan People. But the only images I got were lots of Robins, small Finches, Chickadees and Warblers singing and fluttering around between the Trees and coming to the feeder in a garden in a city. To me the journey reminds us, that the Spirits of Place of whom Maang the Loon is one, wish to be heard and respected as such. 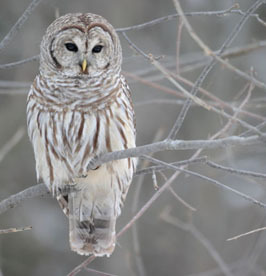 Since the time of Beginnings they are the Guardians of the land upon which we will hold this weekend meeting. They remind is of the plight of their charges – the real wild animals – and hope, we can do something to make it better, or at least stand in respect to hear them and do our part in improving the situation. I wondered, what the ” thing with the Tuna Fish can” was all about, and went “back” yet again today in the morning and there were only Lira, Aya…..! and Fretty (3 of my Miahanits on the back of Gineebik.!???!! I asked, what that was all about and Fretty explained, that I had opened a “nasty can of fish ” that the organizers of the event had not anticipated. I will have to deal with some repercussions, because I posted these TRUTH, that nobody wants to look at. Lira sayed, that always assume that “everyone is on the same page than me”( =vision: all Ee’rens eat Fish….) – But that is not so and I will get to hear about this on the conference by the people in charge there….. I am not surprised to hear that, given I now also read a few of the other participants journeys and … well…. …..let me find a link…. 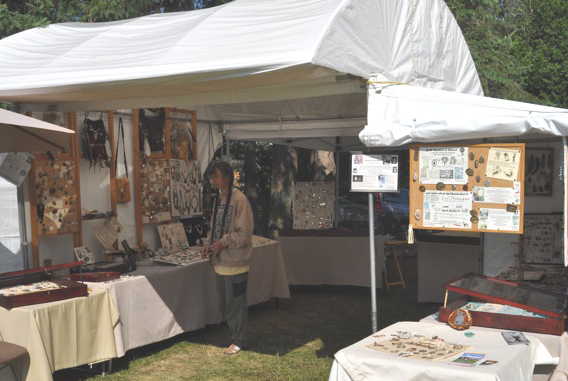 That means I am “coming up for air” and out of the Bearpaw Jewellery earring chaos of craft shows and markets, and my work with shamanic clients and students!!!!! From mid June to mid September things here always race along with “whirrrrrlwind” speed and sadly, in order to keep up I have to temporary drop some of my hobbies, like this little blog here 😦 and sometimes even a few essential practices like daily meditations just to keep up. But I think, from now on I will manage to again write something here every week, about my shamanic practice, about working with students of shamanism and also about my explorations into the world of Divination, Tarot and otherwise. 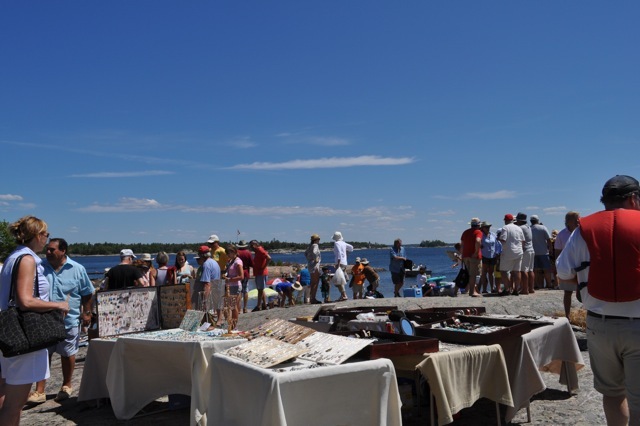 3 days 30 000 visitors…..
A VERY crazzzzy craft show on a barren rock in the middle of Georgian Bay. Bare necessities only, piled into a small rickety boat and set up in spite of gusty winds. 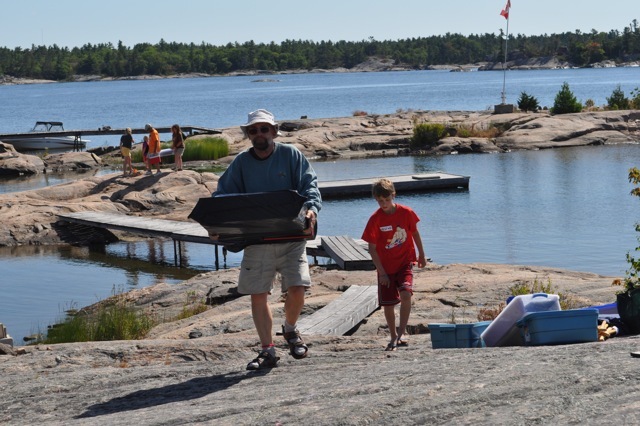 Visitors come by boat and buy everything that is not yet blown of the table….. I will spare you the picture with all of us artisans looking disappointed…. 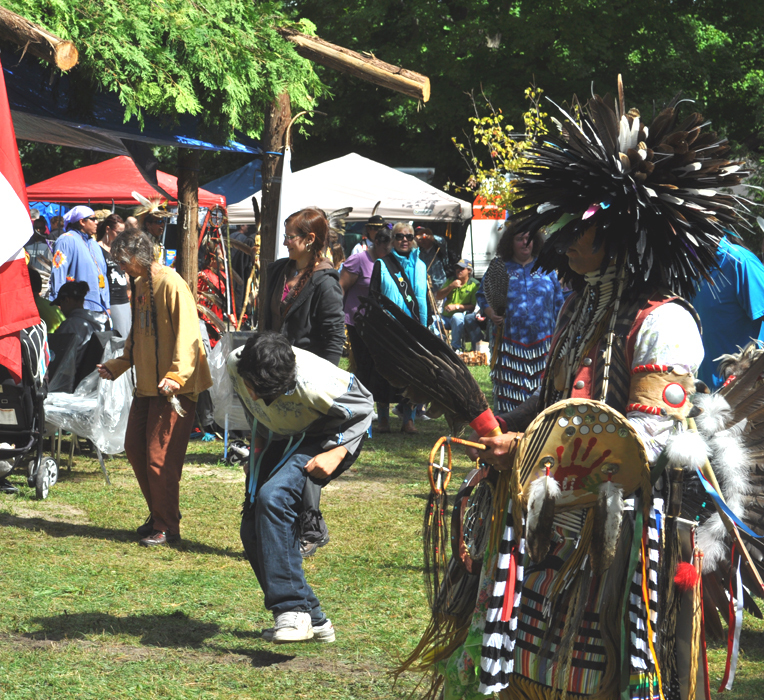 What regalia do you create for yourself, when your heritage is Celtic and Ojibway? 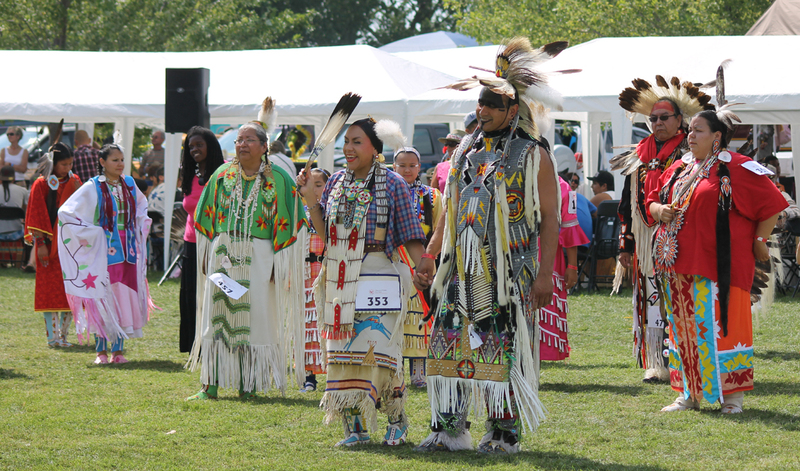 The traditional Pow Wow in Midland had my friends and me dancing the Veterans Honor Dance for our family members.